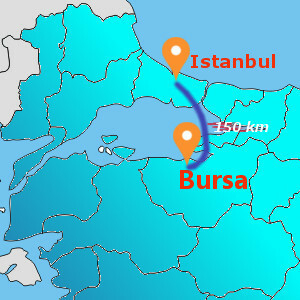 Bursa: The First Capital of Ottoman Empire. Osman Bey, who was born in a town of Bursa, conquered the towns around Bursa in 1299 and this is the year regarded as the founding of the Ottoman Empire, which was to survive for over six hundred years. (The word Ottoman is derived from his name, Osman) Bursa is located in the northwest of the Anatolian peninsula and southeast of the Marmara Sea. The shores of the Marmara Sea are 135 km away. The most important peak in the province is Uludag (Legendary Mount Olympus), which is a ski resort and national park. Mount Uludag (Misios Olympos) : Uludag (2543 m), 36km south of Bursa, is one of the country’s favorite winter sports centers and as well as skiing, its richness of flora and fauna has made it into a National Park and summer activities like trekking and camping are also popular. Uludag was previously known as Olympus Misios in ancient times, and is known in mythology as the place where the gods watched the Trojan war. Ulucami: (Grand Mosque of Bursa) It was constructed between 1396 and 1400 by Sultan Bayezit, fully made up of cut stone, with very thick and high walls, 12 heavy four edged grade, with pendantives as of 20 domes. It is the most classical and monumental sample of the multi – domed mosques. It has the biggest size (318 square meters) among all of the Turkish mosques with its rich and roomy space. Green (Yesil) Mosque: Constructed between 1419 and 1420, It is called Green Mosque due to the green turquoise tiles used on adornments. 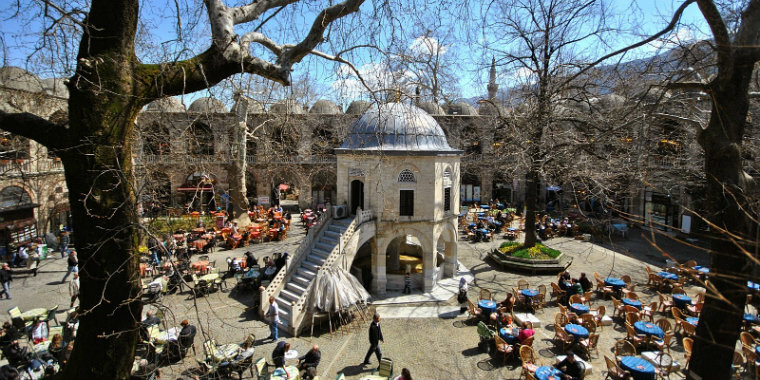 It is one of the most important Ottoman period structure in Bursa, and the mosque is famous with its adornments much more than its architecture. Green Tomb (Center): Structure, which is the symbol of Bursa, is one of the most beautiful samples of Ottoman tomb architecture. Octagonal structure, to which you can climb via a marble stair, is covered by a lead dome perched on a high hoop. It is a unique structure with its tile adornments. Its fully tile covered balcony is a master piece of art. One of the most beautiful samples of the Ottoman wooden work, the door was built by transition technique of walnut tree, adorned with geometrical motifs and has inscription on it. End of the tour transfer back to hotel.